Back in 1990, the Setanta sports channel was developed with a primary aim of proving sports for veiwing by Irish nationals in their homeland and working abroad. How this aim was tarnished when they bit off more than they could chew! 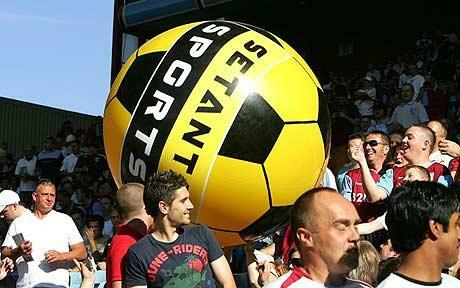 Setanta Sports, the flash in the pan so-called ‘big time charlie’ has gone into administration after failing to make several Premier League, Scottish Premier and Football Association payments, a long side losing up to £100 million per year. They seem to have neglected their responsibility, forget the subscriber, we can subscribe elsewhere. Their own employees and the football clubs who have come to believe a new era for the lesser clubs is here have been blown to smithereens! This has very little to do with the clubs in the top flight in my opinion, they are above the current credit crunch and the plight it has put on many a football club, Southampton been a prime example! This will seriously have a knock on effect to clubs operating within tight budgets who rely on the funding given to them through the means of television rights to allow them to plan for investment towards moving their clubs forward. Think back to May 2002 and the collapse of the UK broadcaster, ITV Digital, when all football league clubs lost out on £2.5 million worth of their annual income. Several clubs including Queen’s Park Rangers and Swindon Town immediately went into administration. Will this be the case this time? Time will tell. Bids had to be submitted by Monday to buy the rights to the 46 Premier League matches for the forthcoming 2009/2010 season. these have been purchased by ESPN (American Sports Network) and maybe at a slightly lower than previously agreed price. Sigh of relief from the big cheeses, they can sleep easy tonight. But how long before the so-called minnows of the game, namely 8 of the Scottish elite and 24 from England’s 5th division face the difficulty of going into administration or even worse going out of business. Then there is the £100 million short-fall in monies owed to the football association as well as the 200 employees facing definite redundancy now that Setanta has gone into administration. The SFA (Scottish Football Association) is currently seeking talking with prospective broadcasters interested in their leagues rights. There is a strong chance this will not happen and the inevitable of the Glasgow two joining the Premier League south of the border will happen. What happens next for these a long side the Blue Square Premier is anyone can guess but I genuinely believe there will be causalities because of the over valued pricing of purchasing live football, the over ambitious Setanta and the ever more greedy football associations. BSkyB has to take some of the blame for over-paying for the live television rights, but if Setanta could not compete then they should have lived within their means. Only obtaining 60% of their needed level of subscriptions to break-even backs this point up. It is almost monopolised by BSkyB. I would love to see a happy resolution to this crisis within the beautiful game but it won’t be a pretty journey getting to that point. It will be very messy. Very messy indeed. It is a shame when forming a company they chose a name of an Irish Warrior, they should have gone for something full of false promise and failure. P.s. Well done to my partner, Lyndsey and my sister, Joanne for running the Cancer Research 5km Race for Life last Saturday. Over 2,000 women enter and Lyndsey finished 4th with a time of 20m 25secs and Joanne finished 50th with a time of 24m 35secs. Well done ladies!